Riding on Tom Latham and Ross Taylor’s splendid knocks, New Zealand beat India by six wickets in the first ODI. Ross Taylor lavished praise on ‘young’ Tom Latham after the two added a record 200 runs for the fourth wicket to hand New Zealand a six-wicket win in the first ODI against India at Mumbai. The double-century stand between Taylor (95) and Latham (103 not out) is now the best stand for the Kiwis (both at home and away) for the fourth wicket, which gave the visitors a vital 1-0 lead over Virat Kohli’s team with an impressive win at the Wankhede Stadium on Sunday. Taylor and Latham on Thursday had added 166 for the fourth wicket to power New Zealand to a 33-run win in the second tour match against the Indian Board President’s XI. “Sorry guys the young Tom Latham is too tired. Well, give it to him… 50 overs in the field. That’s enough,” said Ross Taylor. “I think he employed the sweep shot over here in one of the Test matches the last time as well to a good effect. I guess Indians are very good, very quick feet when they play spin and traditionally us New Zealanders are not as nimble on our feet and the sweep shot is able to put pressure on the bowlers and adjust their lengths,” Taylor said. “I told him (Tom Latham) to reverse sweep and he did it and he keep doing it so hope he keeps that up because he said he had never done it in a game. He practiced it a lot and it was nice for him to get some success out there with that shot,” he added. Taylor himself has been among runs – he scored 34 in the first tour match and followed it up with a quickfire 102 in the second, and narrowly missed out on a deserving century in first ODI. When asked what was the toughest part of the game on Sunday, the former New Zealand skipper was quick to point out that it was the heat and humidity, which had forced several short breaks and treatments with ice packs, especially when New Zealand were bowling first. “I think it was more (about) the humidity and the heat. Having to field out there for a good three-and-a-half hours, we knew we had to get off to a good start and try and negate the spinners,” he said. “Traditionally, New Zealand come over here and we struggle upfront earlier in our innings and I think being able to rotate the strike with the right-left (combination) with Tom. I think you have got to give credit to (Martin) Guptill and (Colin) Munro. They set the platform for us and we were able to rotate the strike and take it deep. Once we took it deep we knew we were in a good position to win the game,” Taylor added. Taylor warned New Zealand of a fightback from India, who struggled in several departments on Sunday night. “Still have a long way to go, India will come at us hard, obviously one more victory for us to take the series but we know Pune is going to be a tough wicket to play on. We have to start again and not dwell on this too much,” he added. “We trust ourselves and Kane (Williamson) as well. With that line-up we know can take someone to the top, it does put some (pressure) on the bowlers to perform – they did a great job. I think to bring Tom (Latham) here – he was one of our best batters on the last tour and with him the extra ‘keeping responsibility, (it) might be a tough situation to go out and open the batting. “Going forward, No 5 and 6 are going to be the positions we have been searching for, a bit of consistency, I think Tom, not only with his new role as a ‘keeper but to bat at No 5 been very successful (59, 102* and 103* on this tour) and has been very busy. Hopefully he can continue (doing) that and the balance of our side improves with Tom batting at No 5,” Taylor concluded. Ross Taylor lavished praise on ‘young’ Tom Latham after the two added a record 200 runs for the fourth wicket to hand New Zealand a six-wicket win in the first ODI against India at Mumbai. 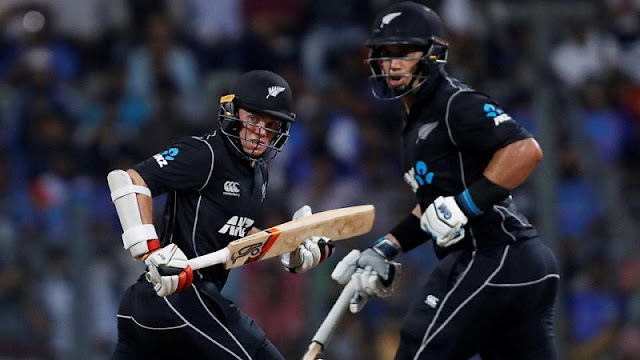 The double-century stand between Taylor (95) and Latham (103 not out) is now the best stand for the Kiwis (both at home and away) for the fourth wicket, which gave the visitors a vital 1-0 lead over Virat Kohli’s team with an impressive win at the Wankhede Stadium on Sunday.